Abdullah Shalty (b. 1953) was born in to a modest family in Abha, Saudi Arabia, within the cohesive and close-knit society of the highlands of the South Western province of Aseer. Abha, the principal town in Aseer, is set at two thousand metres above sea level, surrounded by majestic mountainous landscapes, close to the Kingdom’s border with Yemen. It is a land of dramatic scenery, with steep escarpments and distant views in one direction and gently sloping terraces of rich farmland to the other, dotted with the distinctive architecture of the region. Shalty’s family divided their time between their home and their farm whilst he attended the local primary school in Abha. He then moved to the capital Riyadh before again moving on to secondary school in al Khobar in the Eastern Province, following his elder brother who was a member of the Saudi Royal Air Force Guard. Whilst in Riyadh he received a diploma from the Arts Institute department of the Ministry of Education’s Youth Programme, his artistic talent already being recognised and encouraged by expatriate teachers at a young age, amongst them here was Iraqi artist Salman Abbas al Delaimi, Professor of Fine Arts in Riyadh between 1968-74. In Al Khobar and still in his teens, another Iraqi artist, the highly regarded Shaker Hassan al Said who taught in the Eastern Province between 1968-69, further nurtured his interest in art. Shalty returned to Abha to complete his schooling and then once more travelled to Riyadh to the Institute of Art Education where he was, as he describes, catapaulted onto the arts scene, participating in art exhibitions and competitions, winning numerous prizes and admiring recognition. Shalty’s work draws on subjects that have always been part of his life, the dramatic landscape of Aseer and its remarkable architectural heritage as well as the principal mosques of the Kingdom, in both Makkah and Medina. He is a highly accomplished draughtsman and is known for his unique Pointillist style of painting, using acrylics that combine to produce a richly impastoed surface. Since 1975 Shalty has participated in each of the public exhibitions held by the Ministry of Education and with the Saudi Society of Arts and Culture. 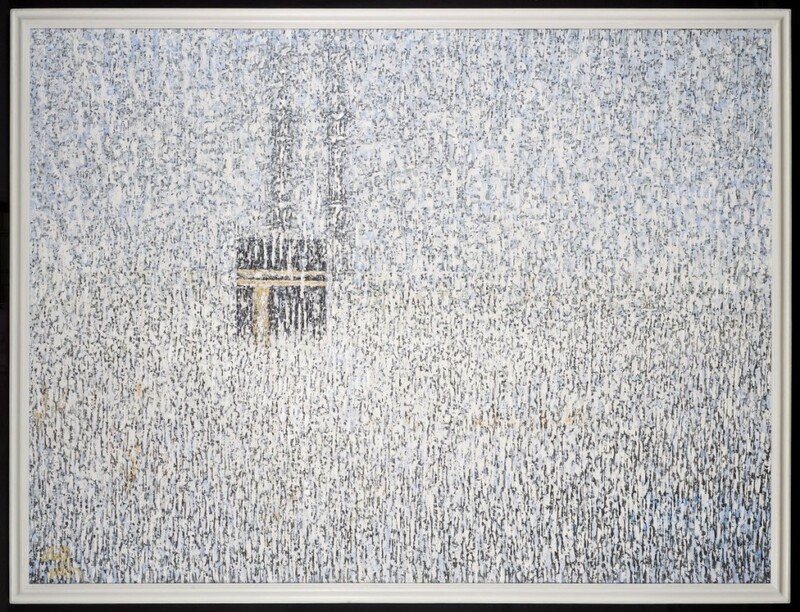 Internationally, his work has been shown in the United States; Vancouver, Canada; the Biennales of Cairo and Sharjah; the UAE; Algeria and Oman. In 2001 Shalty was honoured by HRH Prince Khalid al Faisal who described him as one of the Modern pioneers of Saudi art and an ambassador for the Kingdom’s arts during a group exhibition of work by the leading artists of Aseer, in the Al Muftaha artists village near Abha.